Probably many people know the dangers of smoking, but are not quitting this habit, because they choose more to enjoy in cigarettes, rather than worry about their health. And maybe more often they do not want to know the real truth about smoking as a cause of serious diseases. If you do not care in long term period, make sure about your close future. 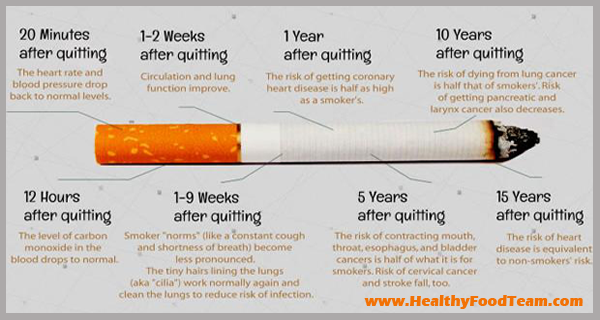 See what positive changes will happen if you stop smoking. Then stop and see for yourself. In 20 minutes your blood pressure will come down to normal. In 8 hours the level of carbon monoxide (a poisonous gas) in your bloodstream will be cut by half, and oxygen levels will return to normal. In 48 hours the chances to get a heart attack will decrease. The whole nicotine will leave your body and feelings of smell and taste will return to normal levels. In 72 hours, your breathing paths will relax and the energy level will increase. In two weeks blood circulation will increase and will continue to improve over the next 10 weeks. In 3-9 months, coughing, difficult breathing and general respiratory problems will decrease as a result of increasing the capacity of your lungs by 10%. In 1 year the risk of suffering a heart attack will decrease doubly. The 5-year risk of getting a stroke will become the same as for non-smokers. In 10 years the chance of developing lung cancer becomes the same as for non-smokers. In 15 years you will have an equal risk of suffering a heart attack as well as any non-smoker.